Have you been told you have a “gummy smile?” Maybe your gum line is not aesthetically pleasing because it has been damaged by periodontal disease? No matter the reason, you feel insecure about the appearance of your smile. You do not have to live with the results. Your cosmetic dentist can resolve the imperfections with crown lengthening. Now, you can enjoy a less invasive solution using a soft tissue laser. Crown lengthening is a cosmetic dental procedure that is used to expose more of the tooth’s surface by removing excessive gum tissue. It can also be used to contour a gum line that has been compromised by injury or infection, like periodontal disease. In the past, a scalpel and sutures were needed to perform the procedure. While it was effective, it was rather painful and invasive. Not to mention, the results could sometimes look unnatural, and there was a heightened risk of complications, like infection or bleeding. As an alternative to traditional methods, you can choose a soft tissue laser. Your dentist will create a customized treatment plan after performing an initial consultation. They may recommend you undergo professional teeth cleaning prior to your procedure. After the foundation is set, you are scheduled for your appointment. Often, many patients do not require any numbing agents; however, there are times when your dentist may recommend a local anesthetic to minimize any discomfort during the treatment. A highly concentrated beam of light energy is used to remove and sculpt the tissue. It allows your dentist to target specific areas with precision to create the exact results you want. The laser cauterizes and sterilizes as it cuts, reducing the risk of infection while also preventing any excessive bleeding. After your procedure is complete, your mouth is cleaned with sterile salt water and the healing process will begin. The laser decreases the recovery time when compared to the traditional procedure. Instead of it taking several months, it may only take a couple of weeks. During this time, it is normal to experience some slight pain and swelling, but they will subside within a few days. To manage any discomfort, use over-the-the-counter pain relievers and cold compresses. Maintain your oral hygiene while you heal but be careful when cleaning the gum tissue. 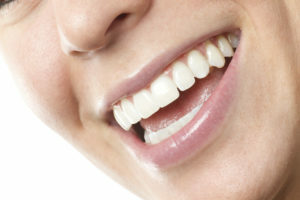 It is best to avoid foods that can irritate or damage the gums, such as those that are hard, crunchy, or spicy. If you are ready for a confident smile, it is time to see if crown lengthening is right for you. Dentistry at Hickory Flat is committed to helping our patients achieve their best smile possible using the latest advancements in dental care. We offer cosmetic procedures to improve the appearance of your teeth and gums, including laser crown lengthening. To get the smile of your dreams, contact our office today.